In Probably Pistachio, Jack's not having a good day! He can't find his shoes, he spills milk on his homework, and worst of all, he has tuna fish for lunch. Will things ever get better? As Jack ponders the probability of a number of things in his 'bad day', readers what probability is and how it's determined. Full of probability terms like probably, usually, sometimes, and nearly always!!! Part of the Math Start series, this book can be a fun supplement to early probability lesson plans. Murphy's writing is clear and kid-friendly and the use of school day activities (homework, bag lunches...) will help kids see that probability is present in every- day situations. Fun illustrations add to the learning but keep the tone light. And, like all Math Start books, extensions activities are included at the end. Read the story together and ask your child or students to predict what they think will happen and why. Ask questions such as: "Do you think Emma will have pastrami for lunch? Why do you think that?" 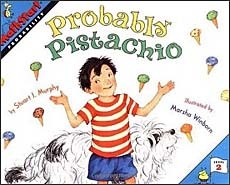 As the children's understanding of probability grows, ask questions such as: "Why didn't Jack's predictions come true? What question could Jack have asked Emma so that he might have made a better prediction?" Ask your students to decide if certain events are likely, possible, or unlikely. Suggest events such as: "You will go to bed at 8:30 tonight." "We will all go swimming on Saturday." "No one in your class will be absent tomorrow." Keep track of local weather reports for one week. Make a list of the predictions and then record the actual weather. Have your child or students decide how accurate the weather reports were. This book is one of the MathStart series books. We LOVE the MathStart series. The stories are funny and cute...and SO effective for teaching the specific math concept being targeted. You can learn more about this great series of books by clicking on the book covers below or the link above.